A few days back, it was reported that the payment details of the customers, who made payment on the official website, were stolen and OnePlus said that the company would be investigating this issue. Due to this, the company stopped credit card payments on the site to prevent any further loss. Today, the company has admitted that credit card info of up to 40,000 customers has been stolen. OnePlus said that the company has sent an email about this whole issue to the users that are possibly affected. WHAT HAPPENED & WHO’s AFFECTED? According to the company, there was a malicious script that stole all the credit card info while it was being entered on the payment page. OnePlus said that the infected server was quarantined. This has once again raised questions related to the privacy of the users. 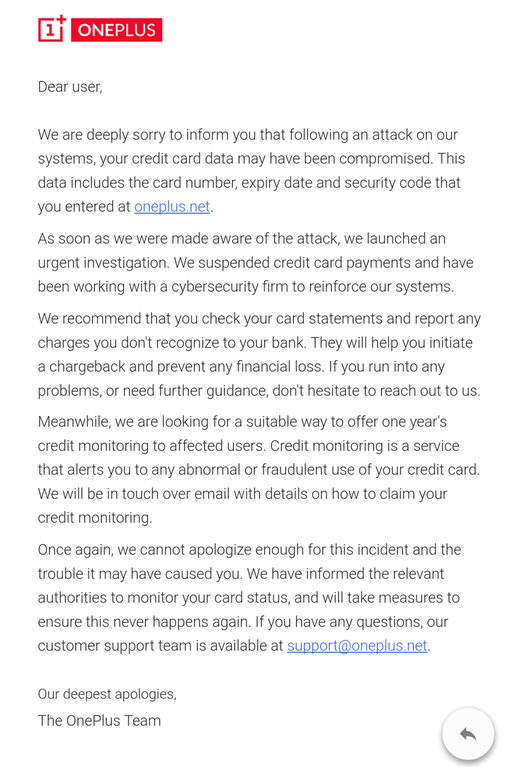 Talking about the users affected, OnePlus said that the credit card data of those users who entered the info between Mid-November 2017-January 11 2018 might be stolen. It cannot be said if all the users had their data stolen. But, users who paid via the ‘Saved Credit Card,’ ‘Credit Card via Paypal’ or ‘via PayPal’ should not be affected, says OnePlus. Well, if you made a payment between those dates, make sure to check your card statements. What are your thoughts on this incident? Do let us know via the comments section.